The weekend promises to be an amazing one with the chance to explore and discover some of the incredible local food and wine interpreted by some of the top chefs from here and overseas including the master himself Heston Blumenthal who never ceases to delight with his unique and challenging creations. It will be interesting to see what he offers and to see his take on the local produce as well as experiencing all that is on offer again this year. 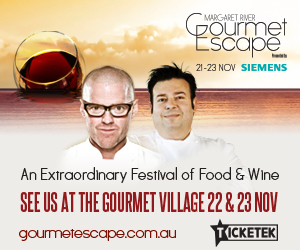 At the heart of the Margaret River Gourmet Escape festival is the must see Gourmet Village. A buzzing world of culinary excitement and the perfect opportunity to experience the delectable delights the region has to offer. Hosted at Leeuwin Estate Winery from 11am-5.30pm on Saturday 22nd and 11am-5pm on Sunday 23rd November, it’s where all our culinary stars such as Heston Blumenthal, Rick Stein and George Calombaris come together across one action packed weekend program filled with cooking demonstrations, wine tastings, masterclasses, intimate Q&A’s and panel discussions. We love your blog Mark and I wish I was the lucky recipient of the Margaret river escape it would be a wonderful escape considering I don’t want to remember this milestone birthday .